I am typically a happy camper with my bowl of yogurt and fruit, muffin, or cereal, but every few days I turn into a ravenous beast who can only be satisfied by something more substantial and savory. It’s not an easily solved problem because as much as I love to cook, I do not enjoy cooking at the break of dawn. Adding to the complication, I don’t like starting the day feeling overly full. Satisfied, yes; stuffed, no. In addition to it’s great taste and superstar nutrition profile (the only vegetable-source of complete protein), it makes me feel wonderful: satisfied for hours, yet not too full. I’m already a quinoa porridge fan,Once cooked in a square, this little casserole of sorts can be cut into handy, on-the-go breakfast bars. They are super-simple to prepare, too. The only semi-fussy step is squeezing the liquid from the frozen spinach. Fear not; it’s really not difficult or time-consuming. Just plop the thawed spinach in the center of a clean, thin-ish dish towel and start squeezing. Thinking of something/someone that/who annoys you will make even faster. Just be sure to rinse the towel well before throwing it in the hamper. I like these bars exactly as they are, which is in itself a rarity, as my recipe-tinkering is a constant. But these lovely bars can be accessorized in countless ways to your liking. Think herbs. Cheeses. Even bacon. Oh, and you could definitely have this as a side at dinner or lunch, too. Enjoy! I added 2 teaspoons of dried herbes de Provence; entirely optional, but yummy. I am obsessed with foil-lining my baking pans because (a) I loathe washing pans and this eliminates said chore; and (b) it is so much easier to remove the baked item and cut into bars, squares or other portions. Preheat oven to 350F. Line a 9-inch square baking dish with foil and spray with nonstick cooking spray. Combine the quinoa with 2 cups water in a medium saucepan. Bring to a boil over medium-high heat. Reduce heat to medium-low, cover, and cook 14 to 16 minutes until water has been absorbed, Transfer to a large mixing bowl. Place the spinach in a clean dish towel and squeeze out all of the liquid. Add spinach to bowl with quinoa along with the oil, cottage cheese, eggs, green onions, salt, pepper, and (optional) dried herbs. Stir until well blended. Spread quinoa mixture in prepared pan, smoothing top. Bake 55 to 65 minutes until set and golden brown. Transfer to cooling rack. Cool at least 20 minutes or completely, then remove bars from pan using foil; cut into 16 bars. Store in refrigerator, Serve cold or re-warm for 15 seconds in microwave. Keeps 3-4 days, covered, in refrigerator, or freeze for up to 1 month. Quinoa and spinach are one of my favorite combos. I will be making this for the weekend most defiantly! Thanks for the delish recipe. we are sympatico re: ingredients, Nicole 🙂 Hope you enjoy these! There are few posts that inspire me to run out and buy ingredients to make it right away. This was one. As a savory breakfast lover who can’t eat much in the mornings, but reall need to these are an amazing alternative to oatmeal. They are very yummy. Thanks so much for sharing. Hello, this recipe looks great, however, what would be a good non dairy substitute for the cottage cheese? My stomach cannot stand dairy. Nimrodiel: Thrilled that you made them!!! Sanako: I think an equal amount of mashed tofu would be a good option. I would use soft as opposed to firm or extra firm. Let me know if you try it! Would it be okay if I were to use fresh baby spinach? If so, how much would I use? Found the recipe today and made it tonight! Just took it out of the oven. yum, that sounds amazing! Love mushrooms…and smoked provolone…brilliant! You list 2t olive oil in the ingredients list but do not mention it in the instructions. Is it added to the mixture? These were great! Do you think they would freeze well? Jarchs: your variation sounds great! Would you happen to have the nutritional information on this recipe? Specifically, carbohydrates per “serving”. Thanks, this looks wonderful! I thought this would be a nice alternative to lasagna for me since I am diabetic. BTW, beautiful pictures! This was great! Can you add more veggies? Just found this looking for savory energy bars that I can carry on a long run or bike ride. I’m questioning the food safety of carrying this for extended periods of time without any refrigeration. Thoughts? Alas, these wont be good for long term without some sort f chilling. 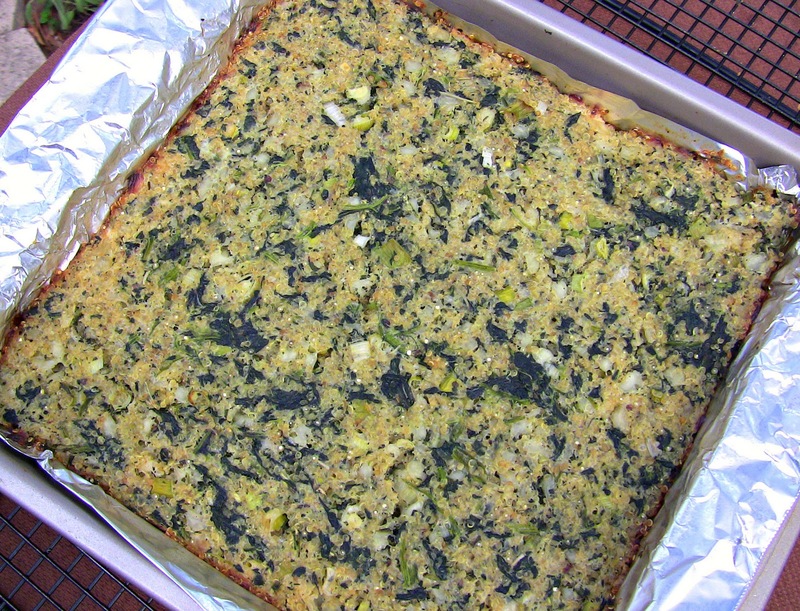 but…I will be posting a savory , portable energy bar Tomorrow! Hi Dennise! While I have not tried it, a good friend of mine (who was strictly vegan, but now eats eggs) substituted an equal amount (1 cup) of silken tofu for the cottage cheese and she said it came out perfectly. Let me know if you give it a try! Hi Marisia! Yes, with a caveat: I would give the spinach (if using frozen) a good chopping in the food processor before using (sometimes it can be a bit stringy/tough, and hence hard to make mushy); you could also use a bag of fresh spinach simply chop fine before using. Once baked it will be very mush- and toddler-friendly!